The discovery and targeting of four Hezbollah tunnels that crossed from southern Lebanon into northern Israel by the IDF has brought back the attention to the sensitive situation in the Levantine nation. Since 2006, following the brief war between Israel and Hezbollah, the area has experienced a condition of delicate peace. While the southern portion of the country has been able to reconstruct and has lived in relative tranquility, the threat of a new war has never completely vanished. 2018 had opened with tension in the country, as Israel announced the construction of a wall on the border out of fear of possible infiltration by Hezbollah elements. The announcement had been met with resistance from the Lebanese government, as in certain areas the actual border line had not been well defined. Hezbollah also stated that it would retaliate by targeting workers. Now, following a careful work of intelligence, and with the use of a special anti-tunnel task force, the Northern Command of the Israeli IDF launched Operation Northern Shield in Israeli territory to detect and destroy Hezbollah tunnels.1 The operation figures in a larger Israeli strategy that seeks to limit Hezbollah’s fighting capabilities. The IDF has launched many airstrikes on Hezbollah targets in Syria, killing high ranking officials and destroying weaponry. Israeli defense companies have also heavily invested in anti-tunnel technology that has been employed both in Gaza and Lebanon. The border between Lebanon and Israel is tightly secured. 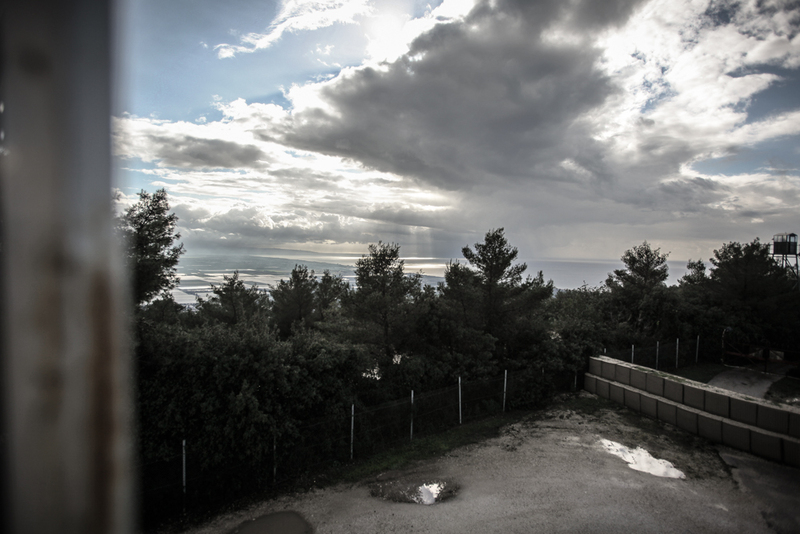 A network of outposts, observation towers, and sensors, combined with a technical fence and road patrols are responsible for securing the Israeli side of the border. Furthermore, a sandy strip that runs along the technical fence and is regularly “brushed” by IDF forces is supposed to reveal the tracks of anyone trying to cross it by foot. 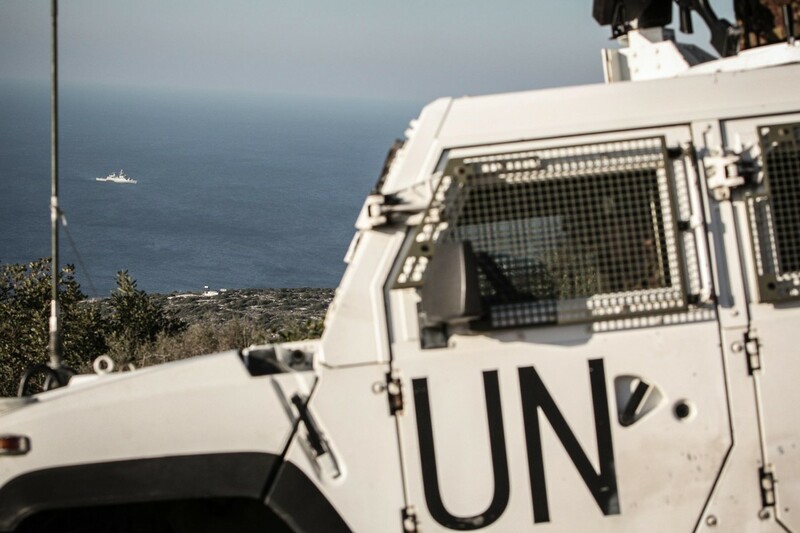 On the Lebanese side, the arduous task of maintaining this peace is the mission of the United Nations UNIFIL mission, which stretches along the border between Israel and Lebanon. The mission, led by Italian Major General Stefano Del Col, who commands ten thousand soldiers from more than 40 nations has been entrusted with preventing conflict and balancing relations between the Hezbollah and Amal dominated southern Lebanon and the Israelis. Outposts and patrols along the blue line – the border, marked by rudimentary blue-painted barrels – are all that stands in one of the most volatile frontier areas of the world. 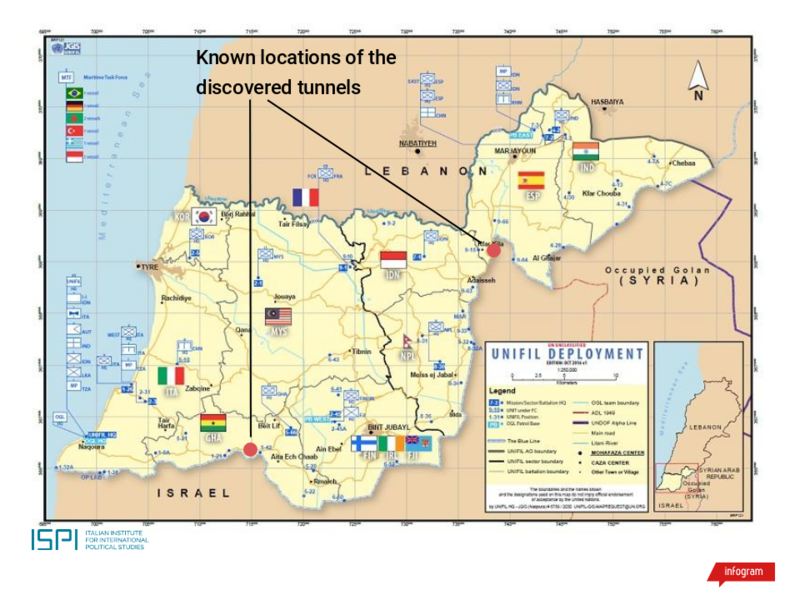 Two of the tunnels in question were discovered in Ramiyeh and Kfar Kala, in the Ghanaian and Spanish contingents’ area of operations, respectively, and one reportedly started from inside a home on the Lebanese side. The Italian-led Sector West, comprises areas managed by Ghanese, Malaysian, South Korean, and a joint Finnish-Irish-Fijian command. The Spanish-led Eastern Sector, areas managed by Indian, Indonesian and Nepalese troops. Hezbollah has long employed tunnels as part of its strategy against Israel. Like other militant groups around the world (like the Islamic State and Hamas), who face opponents with powerful air forces, the tunnel represents an effective tool for guerrilla warfare – difficult to detect and to counter. In the latest confrontations in Gaza, Hamas militants proved how insidious an undetected tunnel can be, as fighters dressed as Israeli soldiers hit IDF positions behind the front lines. Similarly, in Mosul the Islamic State built a complex network of tunnels that was used to maneuver safely, away from the powerful optics of aircraft and drones, and to ambush unsuspecting Iraqi soldiers. In this case, the tunnels were likely to be used as a springboard for the launch of an attack on Israeli positions in the north. Hezbollah militants would sneak under the border and establish strategic positions inside of Israel from which it would engage IDF forces sent to recapture the lost areas. Anti-tank missiles, snipers and infantry would be employed to target the advancing troops. The threat of ATGMs2 on the Lebanese-Israeli border is particularly visible. In the past, Hezbollah has employed these guided weapons, which can engage targets a few kilometers away, to strike IDF vehicles and outposts on the border. During the 2006 war, the Israelis suffered heavy casualties from well-placed missile systems. In response, Israeli static positions along the border have deployed a series of large nets in front of their outposts, with the goal of shielding soldiers from these weapons. In the past years Hezbollah has released videos of training exercises showing similar moves – Hezbollah fighters with flags on their backs simulate an attack on an Israeli outpost and are shown removing and replacing the Israeli flags with their own. Mirroring similar tactics employed by Hamas militants in Gaza, the tunnels could also have been employed for daring raids to kidnap Israeli soldiers and civilians.4 The 2006 conflict between the two started following a cross-border Hezbollah raid that sought to kidnap Israeli soldiers. In January of 2018, conducting research on the ground, I was embedded for a week with the men and women of the Italian Folgore Airborne Brigade, who were responsible for peacekeeping in the UN’s western most area dubbed “Sector West”. 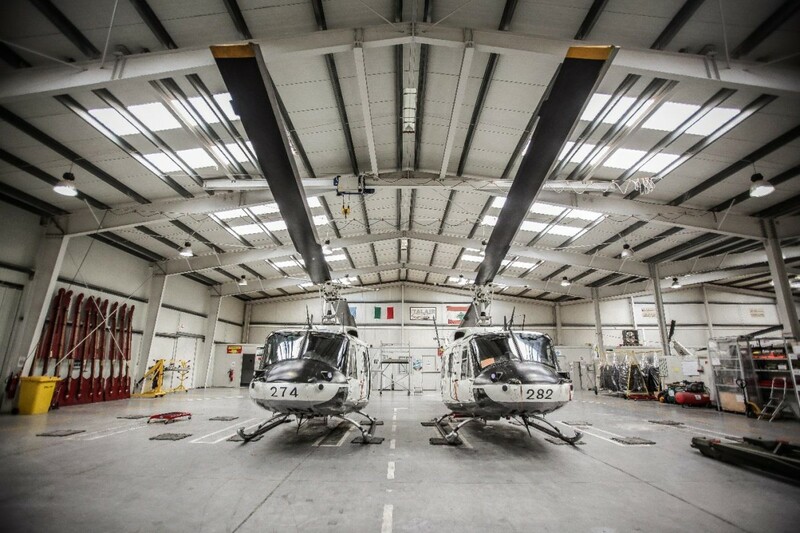 The Italian contingent is composed of a little more than 1000 troops, which now hail from the Garibaldi Mechanized Brigade and a helicopter component of the Italian Army aviation. It is a challenging operation, different from the typical war-fighting missions that troops are engaged in Iraq or Afghanistan. In this mission, every soldier is a diplomat, as the UN forces must gain the trust of local officials and maintain the peace, while also promoting the development of projects in support of the locals. In this case, the soldier must go against his “instincts” and show restraint. It is an important virtue, that in this in this scenario is more powerful than the weaponry that the contingent has brought with it. A difficult task, in a difficult area, where the local support for Hezbollah and Amal can be immediately perceived by the countless flags and posters with the faces of their martyrs that have been disseminated throughout the bristle Lebanese coast. To this aim, the Italian UN officers regularly meet with the mayors of the towns, and support local organizations and projects with the approximate million dollars that have been donated by Italy for this exact purpose. When conducting patrols in towns, the machine guns on the armored vehicles are removed and stored in the cabin – only to be reinstalled after exiting the village. Vehicles move slowly, soldiers who dismount only carry their side-arm, hidden from sight, underneath their jackets. The villagers know that they are armed, and that just outside the of the village, lies a fully equipped response team, but they appreciate the soft posture that tries to not be too invasive and threating. The soldiers walk into stores, buy souvenirs and eat in the local restaurants, exchanging pleasantries, and money, with the locals. This ground work is then accompanied by activity at the higher level. Near Naqoura, one of Lebanon’s most southernmost coastal cities and site of the UN Headquarters, a meeting between Lebanese and Israeli officials is hosted monthly by the soldiers of the Italian contingent. While the two parts sit at separated tables and do not speak to each other directly, it serves as a place for dialogue and to “manage problems”. The cooperation with the Lebanese Army has also been a key scope of the mission. UN troops frequently carry out joint patrols while also engaging in training activities with their local counter-parts. For the Lebanese, it is vital to see that their authorities are present and capable. While the tension in the area can be felt, and conflict is seemingly always looming, what emerges from talking to the citizens of this area is the desire for peace. Security, stability, and development remain the key wishes of the majority of the population, that hopes to continue living normal lives. Since the start of the UN mission in 2006, the area in Sector West has grown significantly – large mansions have sprung up in towns and villages, as Lebanese who emigrated return and invest in their hometowns, while restaurants and board walks are flush with life.